didn't poop on my car. Or me. and there were lots of duckies. This is a White-cheeked Pintail duck. It was a lifer for me! Gaillaridia, one of my favorite Florida wildflowers. One of our neatest critters in FL. fall in, it was very cool. 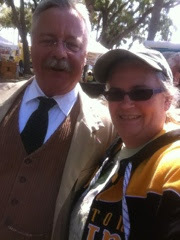 Me and Teddy Roosevelt at the festival after the bird walk.